Despite this staple’s waistline-sabotaging reputation, it can be a delectably healthy part of a balanced diet. Give your pasta a spring-inspired makeover. When you think pasta, what comes to mind? Fettuccine Alfredo? Lasagna with a topping of rich béchamel sauce? Or, the all-time pasta favourite, spaghetti Bolognese? Yes? Then you’re probably also thinking of all the calories such decadent meals contain, not to mention feeling pangs of guilt about eating pasta at all. In Canada we eat 6.5 kg of pasta per person per year, well above the world average of 5.6 kg. But this is a mere fraction of the Italian consumption at 26 kg. Now, if pasta were really such a fattening food, one would expect Italy’s obesity rate to be high. But according to the CIA World Factbook, Italy’s obesity rate stands at 19.8 per cent, compared to Canada’s 26.2 per cent. Surprise, surprise — pasta may not be such a self-indulgent food after all. It’s spring, time to start thinking about what we’ll look like in a few months on holiday in our swimsuits. But do we have to cut out pasta to lose weight? For many people carbohydrates are anathema to a diet, but in reality carbs are a primary source of fuel for our bodies. According to Health Canada, 45 to 65 per cent of our calories should come from carbohydrates, only 10 to 35 per cent from protein, and 20 to 35 per cent from fat. Carbohydrates come in two types: simple (sugar, candy, pop, fruit, milk and some vegetables) and complex (pasta, whole grain bread, grains, lentils, beans etc.). Pasta is a source of complex carbohydrates, which help to sustain energy. What makes pasta particularly healthy is its low glycemic index (GI); between 25 and 45. A lower or higher score indicates how slowly or quickly sugar is absorbed into the body. In this case, slower is better. Compare this to other staples of North American kitchens: white bread at around 75 and potatoes at about 80. Any food with a GI score of less than 55 will raise blood sugar levels slowly and therefore provide a slower release of energy. Foods like pasta, with a lower GI, are more likely to be higher in fibre and will keep us feeling full longer. They also help reduce cholesterol, and therefore the risk of heart disease. The fuller we feel, the less likely we are to consume more food, thus packing on fewer pounds. Because these types of food are digested slower, they keep blood sugar levels stable and help you feel more energetic. As Chef Cesare Trani, previously of Il Covo Trattoria, says, “It’s not pasta that makes you fat, it’s the sauces.” His recipe for crudaiola orecchiette (see below) shows how you can prepare a simple, light, healthy, yet gourmet pasta dish. Pasta is the perfect fit for fuelling the brain, and it’s a wonderful delivery mechanism for other healthy foods that keep us physically and mentally fit. If weight loss is an issue, pasta can still be part of your diet; it contains no fat (unless you add it), is salt free (do check the label on your particular brand), and contains 100 calories a cup. Remember, pasta fills you up, doesn’t cause your blood sugars to rise quickly and digests slowly so you feel less hungry. Of course, eating plain pasta would be a tad boring so you will need to think about which sauces to add, and which ingredients to add to your sauces. There are some basic things you can do right off the bat, the first being to make a fresh tomato sauce rather than buying one ready-made off the shelf. Store-bought sauces contain fat, salt and sugar, and less fibre than homemade sauces. One leading brand contains 11 g of sugar and 2.5 g of fat per half-serving. And beware of low-fat sauces; they often increase sugar content to compensate for loss of taste. Making your own basic pasta sauce is unbelievably simple and quick. You can use canned tomatoes (use high-quality Italian for the best taste) or fresh tomatoes (plum or Roma). If you are using fresh tomatoes, dice them (you can even leave the skin on, but remove the core). Add dried basil and oregano, and a pinch of red pepper flakes to taste. Next, add enough tomato paste to thicken, plus a healthy slug of olive oil. Finish with salt and pepper, then cook for 20 minutes (simmer canned for about an hour to remove the tinny taste). Serve with the pasta as is, or purée to whatever consistency you prefer, and violà you’ve got an excellent, healthy basic pasta dish. If you have more time, dice onion, celery and carrots and fry until soft prior to adding the tomatoes. Another simple calorie-cutting tip is to reduce the amount of pasta and replace it with spaghetti squash; vegetables like zucchini sliced thinly into ribbons; or red, green, yellow and orange peppers, thinly sliced. There are many ways to make a faux pasta with thinly cut vegetables, such as spaghetti squash. But if only a real pasta will do, try whole grain pasta (pasta integrale). You will get triple the fibre, fewer calories, a quarter more protein and double the B vitamins and minerals of its paler cousin. If you are gluten intolerant, check out your grocery store shelves as gluten-free choices made from ingredients such as white and brown rice, corn and quinoa are becoming increasingly easier to find. 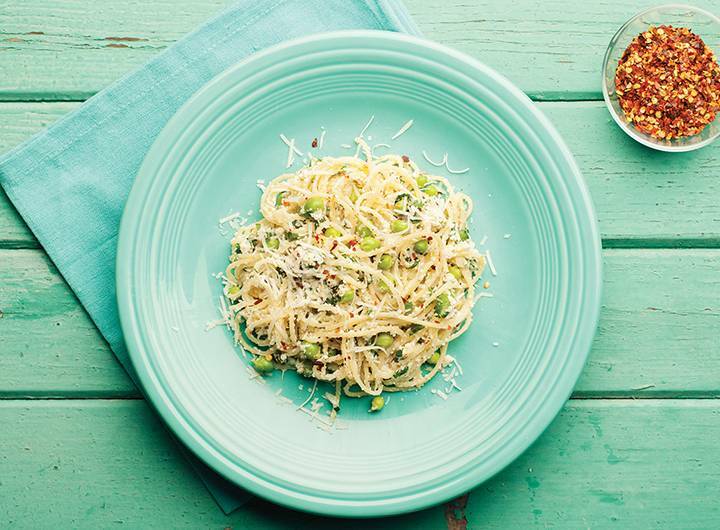 Quinoa pasta, made from quinoa flour, has a similar taste and texture to wheat pasta and is also gluten free. Although thought of as a grain, quinoa is technically a fruit. Pasta translates well from casual fare to fine dining. Go gourmet by being adventurous; try something other than standard cream or tomato sauces. Keep away from pre-made sauces and prepare your own. Use more olive oil and seek out the traditional Italian methods for preparing this amazingly versatile ingredient. To inspire you, YAM asked chefs from various regions of Italy to come up with healthy pasta recipes our readers would want to cook time and time again. Our three stunningly simple and amazingly tasty recipes will get you started. Buon appetito! 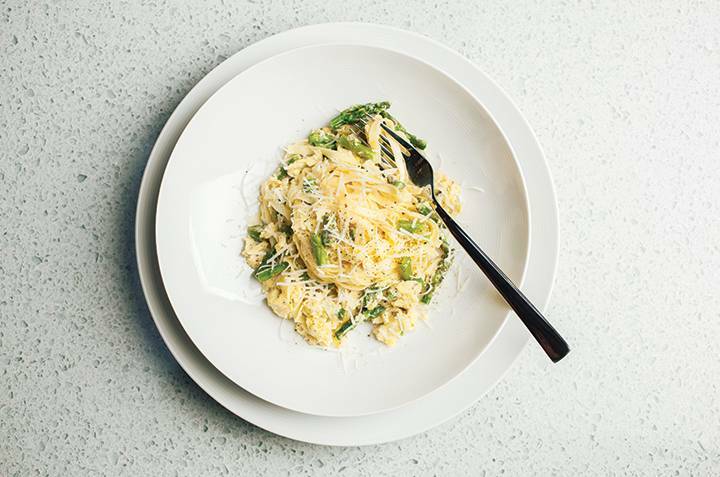 Chef Peter Zambri’s tagliatelle with asparagus, eggs and pecorino. Have a pot of boiling salted water at the ready to cook the pasta. Crack two eggs into a bowl, season lightly with salt and pepper and about 1/4 of the pecorino, beat well to mix yolk and white. Set aside. On medium heat, put half the butter and half the oil in a large sauté pan. Place the asparagus pieces and garlic into the warming fats and start to soften the fibres in the asparagus, being careful not to put too much colour on them. This process is called “sweating.” Season with salt and pepper. When the asparagus is softened, drop your tagliatelle into the boiling salted water. The pasta should take about 6 minutes. Check the package for cooking time. While the tagliatelle is cooking, go back to the frying pan and pour the eggs over the asparagus and scramble the eggs carefully. When scrambled, add the vegetable stock. Drain pasta well and add to asparagus and egg. Put the remaining oil and butter on the pasta and sprinkle over the last of the cheese. Add a few drops of truffle oil. Fold everything together to combine and melt the butter. Portion into four warm bowls, grate more pecorino on top and add freshly ground pepper. From Chef Angelo Prosperi-Porta, author of the award-winning Flavours of Cooper’s Cove Guesthouse. Spaghettini is a thin noodle that cooks much quicker than normal-sized spaghetti, so it is important to have all ingredients ready at room temperature before assembling this dish. Perfect for a quick lunch or spring or summer dinner. Bring a large pot of water to a boil. Add salt and the spaghettini and cook to al dente, about 6 minutes. Meanwhile, combine the extra virgin olive oil, ricotta, mint, parsley, grated cheese, chili flakes, salt and ground black pepper in a serving bowl. Before draining the pasta, set aside approximately 3/4 of a cup of the pasta water for the sauce. Add the peas to the pot with the noodles and heat just to warm through, about 30 seconds. Drain the pasta and peas in a colander. Add about 1/2 cup of the pasta water to the serving bowl, stir in and adjust with more of the pasta water if needed. Add the cooked spaghettini and peas. Toss well and serve immediately with extra grated cheese and drizzle with a little more olive oil. Marinate all the ingredients (except pasta) in olive oil for two hours. When the marinating time is almost over, cook the orecchiette in boiling water with a little salt for about 11 minutes. A few minutes before the pasta is cooked, warm a pan and add some of the oil from the marinade and the tomatoes and warm them through. Once the orecchiette is cooked, drain it, put it into a bowl and add the cherry tomatoes. Strain the cheese and fold it into the pasta and mix.